Honeycrisp apple's harvest season ranges from September 15 to October 10 in east central Minnesota. 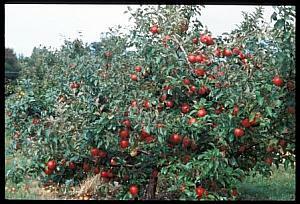 Optimum harvest usually occurs in the fourth week of September, approximately one week after McIntosh and 2 weeks before Red Delicious. Earlier harvested apples are generally mild in flavor, while fruit from later harvest dates may be strongly aromatic. Honeycrisp apples ripen evenly and hold well on the tree. They can be harvested over an extended period or in a single picking. 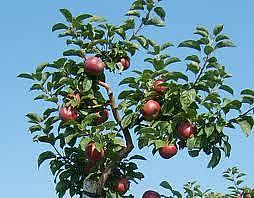 Although fruit adherence is usually good, trees with excessive crops may show some fruit drop. Thinning of heavy crops is advised since over-cropping may also adversely affect flavor and fruit quality. Honeycrisp blooms in the early to middle part of the apple flowering period. It produces viable pollen that has successfully fertilized numerous other cultivars in experimental hand pollination. Honeycrisp does not carry any known exceptional resistances to diseases or insects. Apple scab and cedar apple rust lesions have been observed on the leaves but these diseases have been readily controlled with a standard spray program. It has shown moderate susceptibility to fireblight. Supplemental applications of calcium may be useful in preventing bitter pit.